Hi Bill! This Bob Schubert, KC4FNE in Blacksburg Virginia just wanting to say hello and taking the opportunity to say "Thanks" for the SolderSmoke Series. I have to let you know your podcast accompanies me as I do my early morning exercise regime. Before SolderSmoke, I would begrudgingly get out on the track every other day. Now I'm out there just about every morning listening to a new episode. I'm not sure what I will do once I exhaust all of the episodes? Normally I would cover my obligatory 2 miles in 45 minutes, now I'm looking for excuses to stay on the track so as to complete a one-hour or so episode. 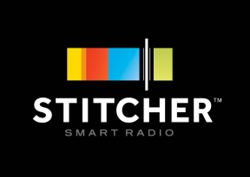 When I'm listening to it in the car, I find myself circling the block just so I can finish a podcast. It has also prompted me to purchase the SolderSmoke book. 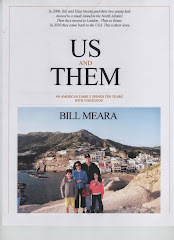 I'm thoroughly enjoying the book as we seemed to have both grown up close to the same timeframe and our early lives led as "geeks." If you interetsted in what an "old geek" is up to now, point your browser to http://www.lumenhaus.com/ This is a solar powered house done by a team of architecture and engineering students/faculty I was involved with. If you ever find your way to Blacksburg and are interetsed in our Lumenhaus, I would be happy to provide a tour. I've included a photograph of me taken at Orange County High School in the mid-60's with a science fair experiment "Talking on a Light Beam." While not quite in the 478THz range of the high-power LEDs it was up there! While modulating the filament on a flashlight I would be hard-pressed to go 95ft much less 95 miles. 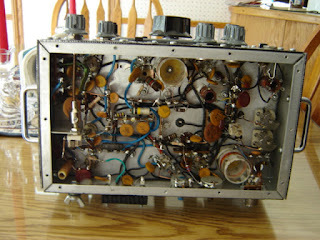 John N. Shive rocks the universe with his 1959 wave machine. We saw this device some time ago in a video in which Dr. Shive explained standing waves. Thanks to Armand WA1UQO for alerting us to this gem. I liked this thread on the EMRFD mailing list. The question of how best to generate SSB is very interesting, and I also liked the global scope of the Q&A: Peter in Hungary asks the question, Farhan in India and Allison in the U.S. respond. the best mixer to use? Note that this mixer will not be used to demodulate. into the rig and live with what you get (which is not bad at all). in emrfd. Rick is the guru. I hope he joins this thread. Yes, they all work. You need a provision for adjusting carrier balance on some but anything over 40db will be good. 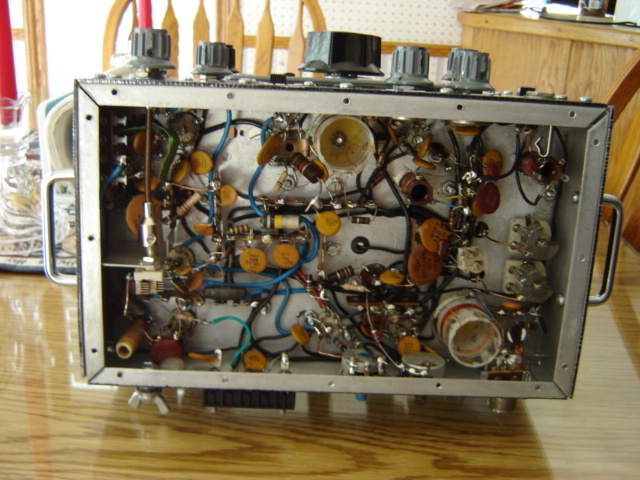 a modulator from many years ago. They all work if the levels are correct. older 1975 through current handbooks and EMDRFD. they are all textbook and all are capable of good results. receiver (any your ears) will tell you if its right. 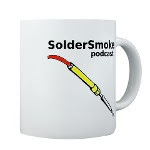 SolderSmoke Podcast #146 is available. 17 Meter Azores rig works...THE AZORES! Commodity Investment Opportunity: SILVER MICA! I didn’t have much growing up but I still had fun! Towers of wood and Pipe that reached close to the sun. Antennas of aluminum and wire seen many blocks away. C.W. into the wee hours of the night. Hot coffee, now I’m awake to stay. 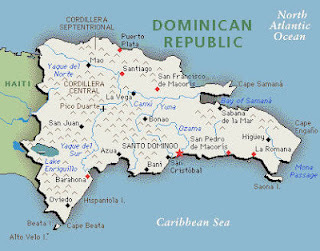 Many pleasant dreams as the radio cooled and the crickets chirped me to sleep. Nestled between Foreign Broadcast Signals, and oh my dinner, I forgot to eat. But YES, I still had fun! A cigar box full of crystals and an antique key, I was determined it was one more watt that I need. Lost them, found them and lost them again but, I still had fun indeed! Sun rising now, Europe on the line, Shadows short and Africa began to shine. Orange glow at dusk the ocean islands start to appear, near midnight now and its Russia I hear. Perhaps these days may all be but gone but my equipment and dreams continue to live on. 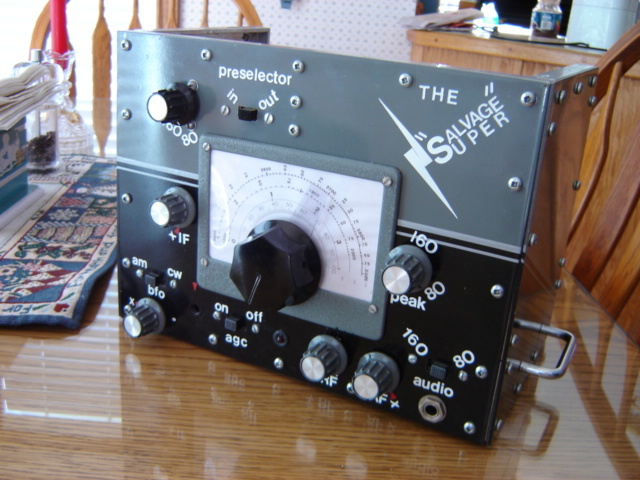 I've been a listener to Soldersmoke for several years, now and look forward to the podcasts and postings. This past weekend our group of microwavers in the Salt Lake City area participated in the 2nd half of the ARRL "10 GHz and up" contest and, for the fun of it, we decided to get on the highest amateur band, the one marked in the rules as being "275 GHz and up." 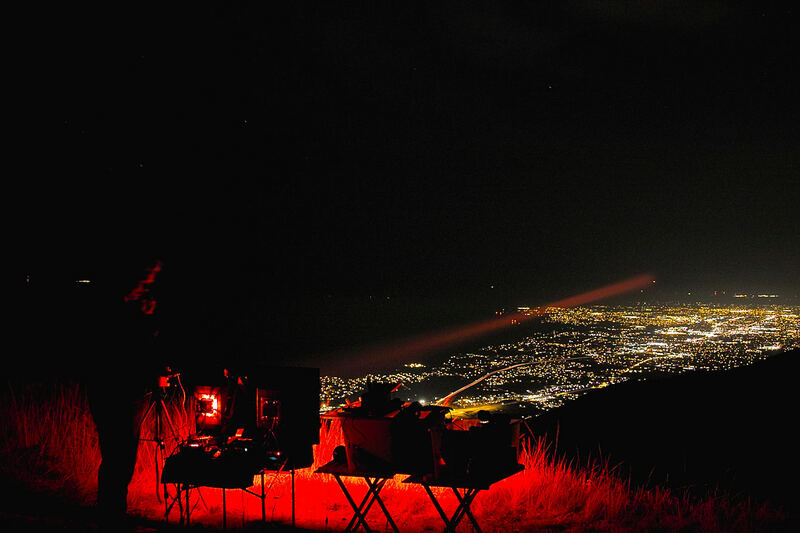 In our case, it was around 478 THz - also known as "Red" - being emanated from high-power (20+ watt) LEDs. Attached is a picture taken from my location at about 9300 feet elevation (grid DN40cx) taken from a location near a minor bump known as "Bountiful Peak" 10 miles or so north of Salt Lake City where I was accompanied by Gordon, K7HFV and Gary, AB1IP. 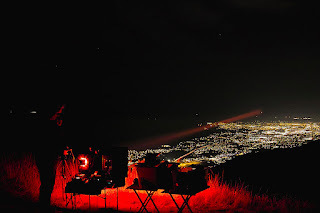 At the other end of the path (the red dot at the far end of the red shaft of light) was in DN31it was Ron, K7RJ and his wife Elaine, N7BDZ located at about 5700 feet elevation near the remote northwestern Utah community of Park Valley, over 95 miles distant. While this isn't our farthest DX (that would be a bit over 173 miles) it was still fairly substantial and gave us the ability/excuse to test some new, updated gear that hadn't seen much light in the field. In doing our testing, we needed an audio source other than our voices so I'd brought along an MP3 player so that I could step away from the gear and still provide a constant source of audio. Among that which was played across the link - the quality of which was extremely good, by the way at about 50dB S/N at full LED power - was your voice from a Soldersmoke podcast. and if you want more, you can follow the link at the bottom of the page. 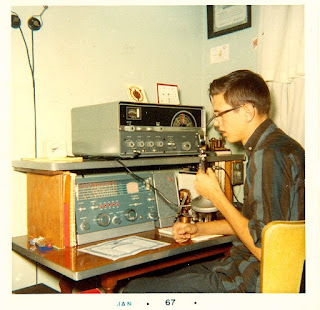 Back in 1965, I bought a brand new HT-37 from a radio store in Pittsburgh, Pa. It had been tucked away by the owner for his own personal collection. He finally softened and sold it to me. 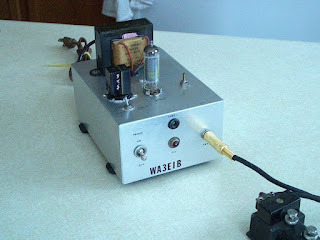 The Hallicrafters HT-37 became by Big Dog for many years. In 2005, I fell on some difficult times and sold it. I regretted the departure moments after the exchange. Well, finally after lots of searching, the right unit came along. Here are a few pictures of my excellent E-bay buy. I will begin to dig into the electrical status of the rig later this week but the unit seems well cared for and not abused. I will keep you posted. It will be happily married to my Drake 2B and Q-Multiplier after it passes muster.Yes fellow hams there are still gems out there for your collections. Just wait for the right buy and then go for it! I know you would appreciate this. 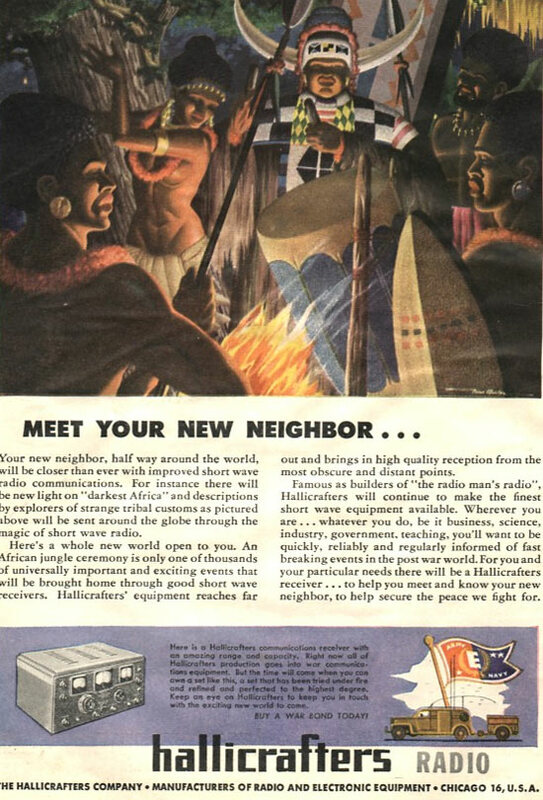 Got an email this morning from a local ham who was getting rid of some "junk" radios, wondered if I or someone else could use them. Once I heard I got over there to pick them up. 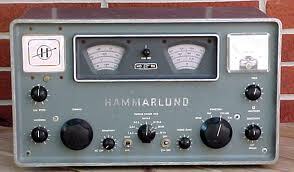 Among the usual, real junk was a Hammarlund HQ-110C receiver, in the original box and a Johnson Viking Ranger, also in the box. With all the manuals as well. The boxes are showing their age, the Ranger's being not much to look at. I am told neither works and haven't been looked at / turned for at least 20 years. What a find! They are very clean and complete, as far as I can tell. The plan is to restore them to pristine condition and, hopefully, use them in one of the local museum as a working station. 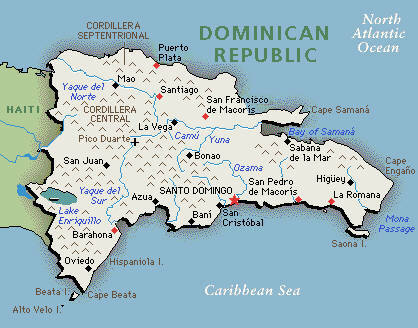 I took this book with me to the Dominican Republic this summer, and I really enjoyed it. Kessler has an unusual, very funny, self-deprecating writing style. He is not a scientist nor an engineer, but he is given access to the inner sanctums of the Mars Phoenix mission, and spends an entire summer watching and documenting the work of the people running this mission. Ah, those were the days! The bands were in good shape and hams built their own gear. Don't let the language barrier deter you -- this German language video is really a lot of fun and worth watching. It provides a nice look at the hobby as it was 60 years ago. Thanks to Stephen and Michael for alerting me to this. 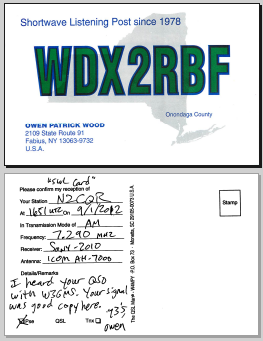 I always like to get QSL cards from shortwave listeners. I suppose this has to do with my broadcaster tendencies. I blame Jean Shepherd for this. Owen heard my K2ZA DX-100 on 40 meter AM. 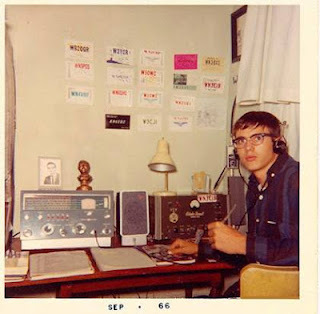 Wow, back in the day the marketing suits from Hallicrafters apparently really knew how to attract the attention of 15 year-old guys interested in short-wave listening. 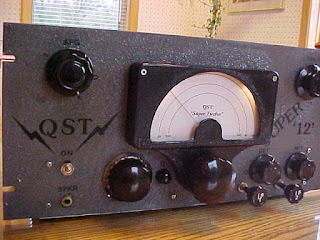 Could that ad have ever possibly run in stuffy old QST? It certainly would have attracted my attention. 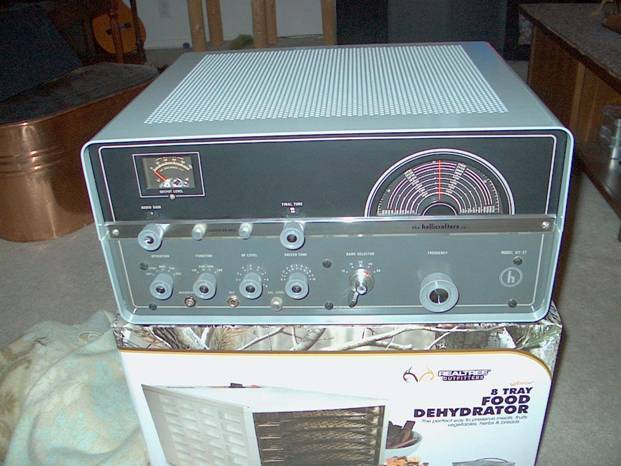 I suspect many a young amateur would have been looking to sign up for a DX-pedition. 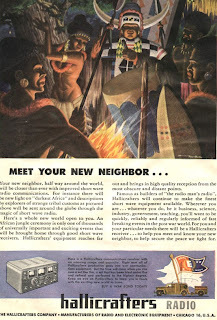 Thanks to Bob, KD4EBM, for alerting us to this unusual bit of 1950s radio-erotica. I had our friend Grayson (in Turkey) in mind when I put Eddy's messages about this "thermitron" receiver on the blog. Well, I think my buddy VE3CSK is 99% "hooked" on the notion of making an MFTMM receiver for himself---and that's a good thing. That rascal of a rig is pretty much fool-proof, & the design sure does lend itself to no end of enhancements / improvements / changes / mods! I should know: with my set-up here I added AVC, and extra IF stage, an extra stage of AF, more pre-selection, etc. etc. etc. As for selectivity, I simply incorporated regeneration in the 2nd IF stage: with judicious tweaking of the BFO, one can achieve a near single-signal selectivity effect that is GLORIOUS on CW. 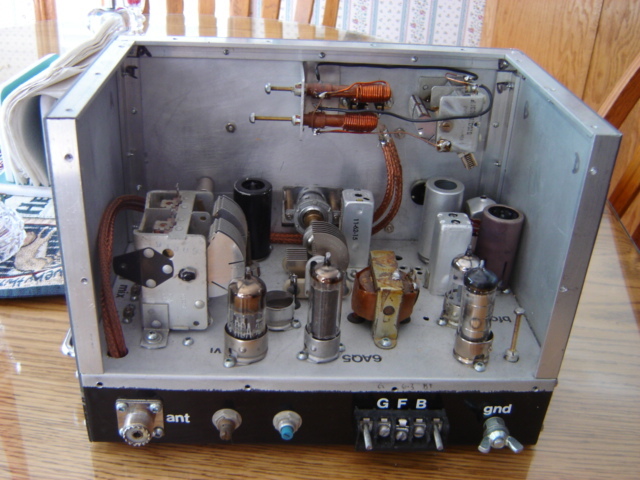 I guess one can make these things as complicated---or as simple!---as we might chose to do, yet further proof of the flexibility of this receiver. I've taken some jpegs of my set-up here, and am attaching them herewith for your perusal. I like the notion of using these rigs on 80- and 40-meter AM, too---but am presently somewhat "distracted" with the task of re-inking my main tuning dial for my 1929-style superhet. I think my next step in my MFTMM receiver here will be the addition of an internal 125 VDC power supply---most likely will mount the components inside, on one of the vertical sides (still LOTSA room there!). I have a FB Hammond power transformer that'd be perfect for the job, & I won't have to connect / dis-connect / re-connect its current out board power supply (that I use with other peripherals, too---a REAL pain by times). A good friend of mine---Bill, VE3CSK---is in the process of collecting parts for an HB receiver, & I've been trying to sell him on the idea of an MFTMM: I keep telling him it's an excellent "foundation" receiver, & that it'll prove to be much more than a toy, or pleasant diversion, if he leaves enough room on the chassis & the front panel for future mods. I think I may be finally winning him over: he's asked me for the references to the rig, & has placed an order for a National-brand slide rule dial with a fellow Stateside! Do you still have your receiver, Bill...? If so, do you have any nuggets of info that might be worth sharing re. it, that I could pass onto Bill...? This rascal can REALLY play---but it's a LOT larger than my MFTMM rig! Hello Eddy! Great to hear from you. I like you FB page on the Super Hets. Beautiful. Yes, I still have my MMRX. Haven't used it for a while, but I am thinking of putting it back in operation -- I am now getting active on 75 and 40 AM, and it would be fun to use this RX. Here is an idea: The 455 kc filter crystals are now un-obtanium. But I'm thinking that we could substitute some 455 kc ceramic filters, which are readily available. I like the receiver. A lot. So far it is my only real tube HB project. Encourage your friend to give it a go! Go to http://www.soldersmoke.com/book.htm for more info. Use the Coupon Code to save 20% when buying from Lulu. 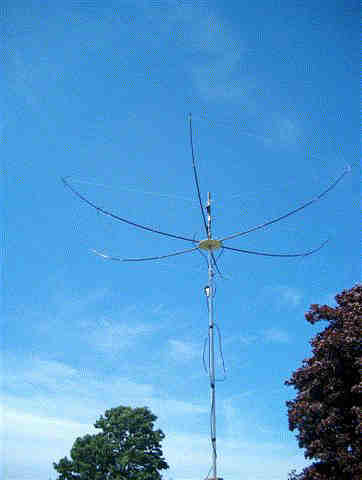 I've been hearing a lot about hex beams, and I think I'd like to build one. 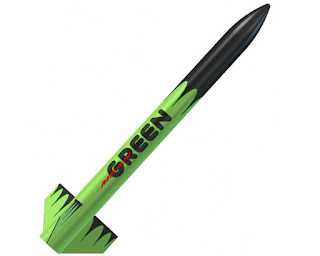 Maybe for 17 and 20 meters. 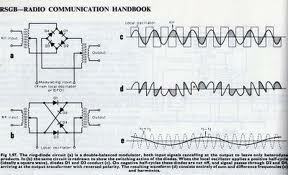 What I really like to do with my CW, however is to operate CW in the Russian language. 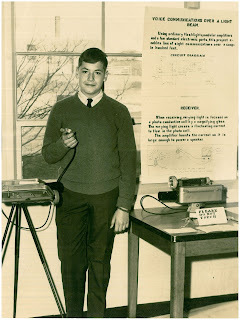 Years ago I taught myself the cyrillic morse code and can use it. Not as fast as the International Morse code but at a usable speed of maybe 15-20 wpm. 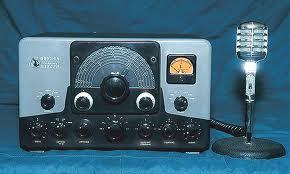 I have had many contacts with Russian stations and really surprised them coming back to them in fluent Russian. It turns out that Russian hams nowadays don't use the cyrillic morse code often and are no longer even required to learn it to get their licenses. Newer Russian hams don't even understand their own language well in CW. But if you can hitch up with an older ham that does, it is great. I had a QSO a few years ago with a ham licensed right after WW2. He told me that our QSO in Russian was the very first one he had ever had with someone outside Russian using cyrillic morse code. That gives you and idea of how unusual it is. Russian hams use the International morse code when communicating with each other even. Switching from International CW to cyrillic CW can blow your mind. To send a Russian V you use our W. If you send a V it is actually their letter with the sound "zh". A C becomes their letter for the "TS" sound. Their letter for the "SH" sound is four dashes. Their letter for the "CH" sound is three dashes and a dot. Send our H and you get a Russian X. Send an X and you get a Russian softsign and so on. Gets confusing until you have done it for a while. I have a lot of fun with it. I wish the propagation were better now. I don't get as many solid Russian QSOs as I did when the sunspot numbers were higher.